Get the facts in this ebook to understand what hard money is, how it works, and where to find opportunity. Hard money loans are not for every situation. But in the right situation, they can be very profitable and lead to additional investment opportunities. The best way to ensure you're making sound moves with your real estate investments is to get educated. 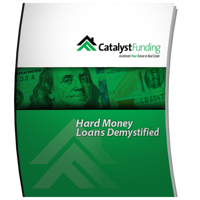 Start by understanding the facts behind hard money lending. Examples of hard money loan success and more!